Cruise for 12 amazing nights around both islands of beautiful New Zealand. Sail through stunning fjords and marvel at towering cliff sides. 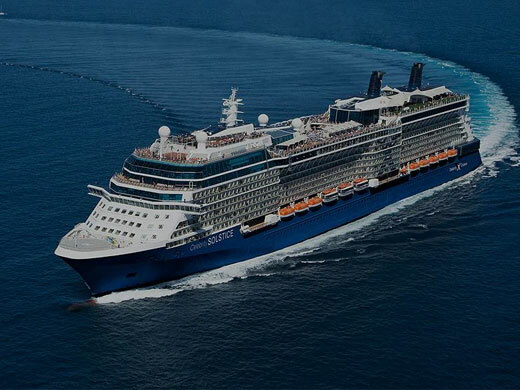 Celebrity Solstice® is one of the most decorated ships. So it's no wonder that it's full of "firsts." The first Lawn Club at sea. The first Hot Glass Show℠. The first cruise line to have five women, known as "the Leading Ladies℠," redesign its staterooms. Celebrity’s passion for outstanding cuisine takes the onboard dining experience to a whole new level. But luxurious staterooms and specialty restaurants are only part of this ship's charm. Celebrity Solstice also features Canyon Ranch SpaClub® and fitness center. Pamper yourself with spa treatments or push yourself in a workout with one of the expert trainers. If only life on land were as good as life on board this exceptional vessel.